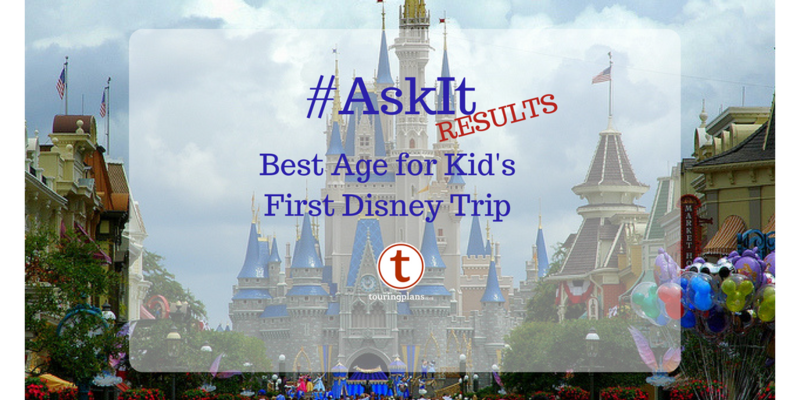 Ask It Results: What Is the Best Age for a Kid’s First Disney Trip? At the end of the day, there isn’t really a wrong age to take a child on their first trip to a Disney theme park. Each age has its challenges, and each age has its plusses. If you are taking your child for their one and only trip to Disney, different considerations come into play than if you’re a parent taking your child for the first visit of many. If your child has siblings, this can also create some interesting dynamics. So many things to consider, but no one ever said that children make your life less complex! 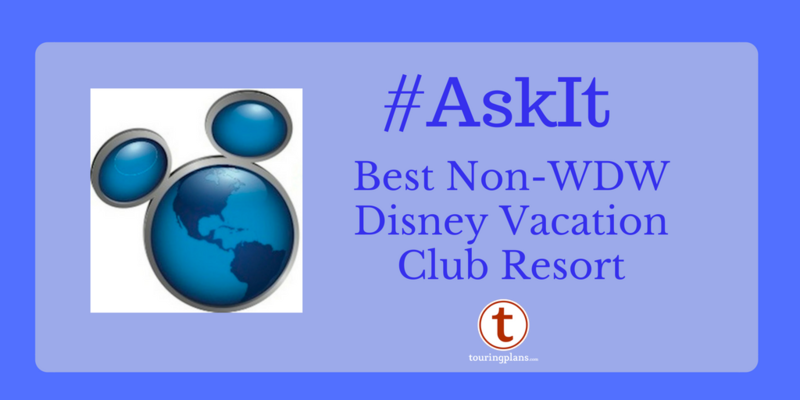 What is the best age for a kid’s first Disney trip? Pros: Kids are free and relatively portable. Cons: They won’t remember much from the trip. Our daughter was six months when we took her on her first trip, and it was so wonderful to just strap her in a chest pack carrier and head out to the parks. (Or at least it was wonderful for me–my husband wore the chest pack.) Strollers meant that we had the ability to carry child and supplies comfortably. There’s something amazing about kids seeing this hyper-intense sensory overload environment at such a young age. Everything is amazing. You have the ability to get incredibly cute photographs, and as parents you get to make some amazing memories. We actually found it easier to travel with a child who wasn’t yet in the throes of potty training, and we made use of the baby care centers at each park. But if this is your one and only trip, your child may not forgive you if you have the chance to make these memories and they just have to hear about it second-hand. Pros: The age of wonder where belief in anything is possible, and the kids are still fairly cheap. Cons: The age of afternoon meltdowns and necessary naps, plus some stranger danger fear of characters. Kids at this age get so excited about all their experiences. Everything is new and thrilling. It really is the best age to experience the world again through a child’s eyes. They can tell you what they like and don’t like, and have insights about their experiences. Most kids at this age are more than happy to eat off the kids’ menu, making it more affordable to take them. Taking kids out of school at this age is generally fairly easy. But there are challenges as well. I think every person who has been at a Disney park has seen a child at that meltdown stage where they simply are “all funned out”. (Needless to say, the parents don’t seem to be having too much fun at that time either.) My first trip was in this age bracket, and after years of being told “Don’t talk to strangers”, I arrive at the park and my parents want to hand me off to Tweedle Dee and Tweedle Dum. (True story.) Naturally, I screamed in terror and tried to hide. Ah, gotta love those first Disney memories. Pros: Still not full adult pricing, able to do more attractions. Cons: School schedules are tough to work around, may be entering the Age of Not Believing. In these ages, many of the height requirements start to be a non-issue. (Now whether you can get your child on the rides willingly is another story.) By this point, they have familiarity with the movies that inspire may of the rides, or have background knowledge to make other attractions entertaining for them. You may not have to take afternoon naps every day with this age group, although some R&R back at the resort is a good thing. Schools may start to give a bit of grief about pulling them out, especially during crucial standardized testing times. And there may be some kids who start expressing disbelief about things that they would gleefully accept at younger ages. (Don’t worry, Mickey–we adults know you’re real!) You can certainly make good memories with kids at this age, and they likely will have solid memories about their experiences. Pros: Able to do anything and everything with their parents, you might not need to take afternoon naps. Cons: You’re paying full adult prices for everything, school schedules are really tough, and some kids may be “too cool for all this stuff”. At this point, you’re not really taking kids with you on a trip–in the eyes of Disney, you’re just taking possibly shorter adults. Tickets are adult priced. Meals are adult priced. It will be difficult to take your child out of school. All tweenage and teenage baggage gets packed along for the ride too, so there may be eye-rolling or attitude about having to spend time with their parents. Not all people at this age are created equal, however. Some family trips with this age group are exercises in awesomeness because you can do everything. Early mornings (well, maybe not *everything*) to late nights, these travelers will keep you a run for your money to try and keep up. Make sure to book buffets–you’ll actually get your money’s worth. And it really is your last chance to create those family memories before the kids are all grown. The down side in that is that you may suddenly wish you had traveled with them when they were younger. That’s it for this week’s Ask It. Next week’s poll is live on Twitter and here on the blog. In the meantime, when was your first trip to Disney, or when did you take your kids on their first trip? Any regrets that you took your kids too soon or too late? Let us know in the comments. 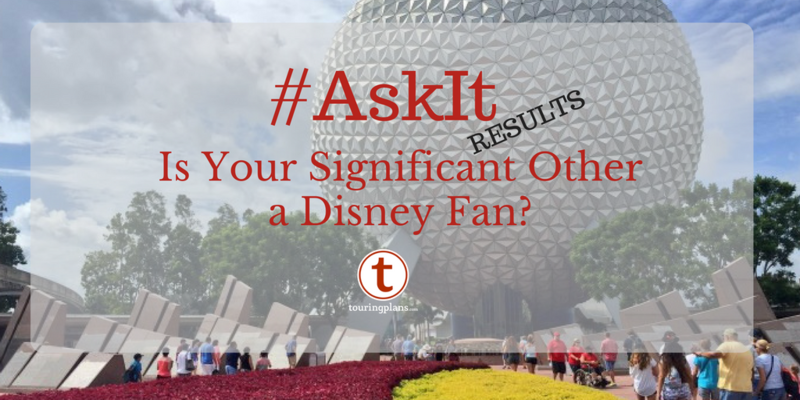 Ask It Results: Is Your Significant Other a Disney Fan? February 14, 2018 Julia Mascardo Comments Off on Ask It Results: Is Your Significant Other a Disney Fan? I generally agree with the results of this poll. However, my wife and I took our first born to WDW as a 2-1/2 year old for our first trips as adults, thinking, “He’s probably too young, but what the heck.” We were so wrong. He may not remember a whole lot, but my wife and I still consider it the best family vacation we have ever had. Period. Subsequent trips included his new sister for her first, second, and third birthdays, and although, we still LOVE each visit, they were just different than seeing it through the eyes of a two year old. My parents took me to Disney World for the first time when I was 16. You guys are going to think we were crazy, but there were no regrets for any party involved. To be fair, I was not a surly adolescent (most of the time). I could ride everything, and feel like a little kid again while appreciating and marveling over the Imagineering. And even a little more than a decade later, and *many* visits to Disney since then, I still have so many very distinct memories that from that trip that lead me to think it was the best one I ever had. Anyway, if anybody thinks they’re “too cool” for Disney, that’s just an attitude problem. I think there’s enough there that anyone of any age can find *something* they enjoy. I would have voted with the majority in the breakdown, but I really think going to Disney when your child especially the youngest child is about 2 and 1/2. They eat free off an adult plate on the dining plan, they can stay in a crib for free so a family of 5 can stay in a value resort, and their tickets are free. I made this trip with one 2 and 1/2, 4 and 6. It was our first trip and it was amazing. She slept a lot in her stroller and still remembers part of the trip. It was magical. There were more positive than negatives though she was terrified of the non face characters.